Our magnets are used under the most demanding conditions in docks, steel works, dockyards, etc. 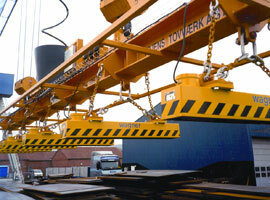 for the loading and transporting of numerous steel products. For us particularly robust and reliable designs used in conjunction with emergency electricity generator for heavy loads are of importance. Our range comprises all kinds of devices: from smallest robot grippers up to special designs for many material handling applications. Electro permanent magnets are particularly used in safety fields and have the complete clamping force even if the power feed is interrupted. In most cases the magnetic systems must be adapted to the respective application in order to guarantee a safe carrying of the load. We have the necessary experience.